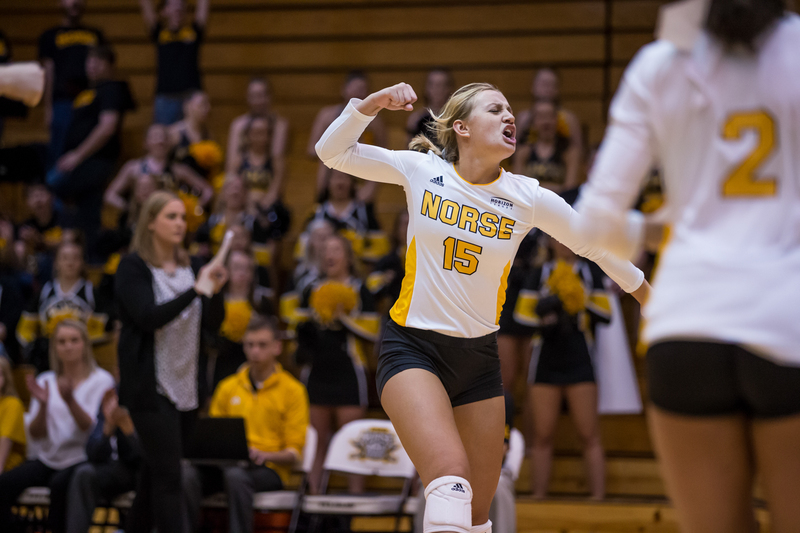 The Norse managed a clean sweep (25-20, 25-22, 27-25) over Cleveland State in the semifinals of the Horizon League Volleyball Championship Tournament on Saturday night. With the victory, the Norse move to 21-8 overall and ride an eight-game winning streak into the final round of the Horizon League Championship Tournament, while last year’s reigning champs close their season out 17-12 overall. Haley Libs recorded her 24th double-double of the season with 11 kills and 11 digs, while Shelby Olsen and Miranda Wucherer combined for 34 assists and 28 digs. The Norse gained an early advantage over the Vikings in the first set and never let up. The Norse finished with a .333 hitting percentage and a total of three aces collectively from Olsen, Wucherer and Anna Brinkmann. Libs led the offense with six kills, while Brinkmann led the Norse defensively with eight digs. The second set was a much more defensive effort for both teams. Collectively, the two teams earned a total of 60 digs with Wucherer and Ashton Terrill leading the Norse with seven digs apiece. Offensively, the Norse were led by Natalie Hardig with five kills on 10 swings. After the Norse held off a 5-0 run by the Vikings late in the final set, the last four points were highly contested and contained three challenges by both teams. The only call reversed was the 24-25 point that resulted in the score being tied at 25, after the officials ruled that Payton Bagwell’s kill touched the Viking’s block. From there, the Vikings made an error which brought the Norse up to set point before Wucherer finished the match with an ace. The Horizon League Championship will be held on Sunday, Nov. 18 as the Norse face the Green Bay Phoenix with the winner advancing to the NCAA Tournament. First serve is slated for 3:00 p.m. and will be broadcasted on ESPN+.